Again, let me lead off with a personal note. My move to Lake Monticello is complete. I have DSL. My new address and phone number at the bottom of this page. I have high speed Internet access, but there will be no e-mail address changes. I feel confident that the move has not effected "ankerstein.org" in any way. And now to important information -- Anchor. Look at the building on the left. It is built with just one set. But that set is a 6A, not a 6. This building is featured on the builder's page. Chad Bunnell of Athens, Georgia, USA, bought set 6A instead of set 6 because he thought that with the longer beams and more stones there were more building possibilities. Certainly, had he bought his set from me, I would have insisted that he start with set 6, not 6A. (By now he has bought set 6, so his heresy is at an end.) In addition to this unusual building, some pictures of a chandelier, cast in bronze by Chad are shown on the builder's page. They are not Anchor, but they are interesting. A better report on the metal parts from the Bridge Set (1895) will have to wait until I have done more unpacking and organizing. And the report will appear in the MLB of the CVA, which is the proper forum for any article on Anchor and Richter history, stones or sets. Again, let me note that the reproduction parts made by Rob Buis and Fred Hartjes are remarkably accurate. Please note that set # 20A will be available for delivery in the USA in late June. I am sorry about the delay. Pricing is shown on the new puzzles and sets page. The last CVA meeting was on Saturday, April 26, 2003. The next meeting date will be on Saturday, October 25, 2003. See the CVA page for details. The CVA has published a Stone Catalog. I still have two copies, in the correct European binder -- $30, ppd. Even if you have no other Anchor reference book, you need to buy this one. This catalog is not, and will not become, available on CD-ROM, and the next update won't be available for many months (if ever). Since it uses a loose leaf format, you will need only the pages which change. The update is concentrating on the contents of the more uncommon sets. The amount of detailed information in this catalog is very great, and the information keeps coming in. And it has become clear that e-mails with just numbers of stones in a set will not do; Leo Coffeng must receive a photocopy or scan (in color if at all possible) of an actual packing plan to be sure. 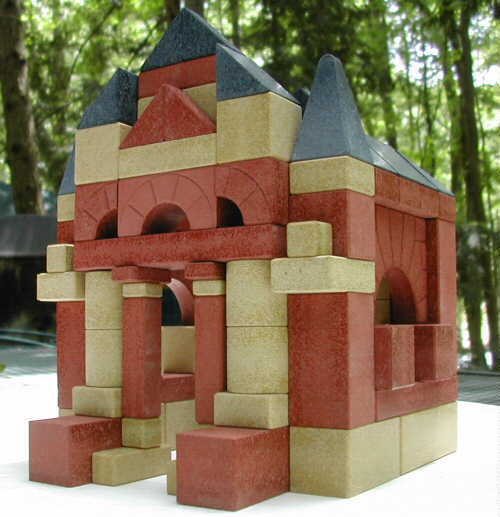 Richter's Anchor Stone Building Sets (Richters Anker Steinbaukasten) were the world's most popular construction toy from the early 1880s through W.W.I. These building stones were made in Rudolstadt, Thuringia, Germany, (and at the company's branches in Vienna, New York , but not St. Petersburg, Russia). Starting in 1880, Richter's Anchor building stones were covered by international patents and trademarks. AV Burkhard Schulz, Ellerau bei Hamburg, has produced a wonderful video entitled Ankerstadt Rudolstadt. He gave a copy to the CVA Archive, and it is possible he might let you have a copy if you want one. Americans remember: 1) the video is in German and 2) the German TV system is not compatible with the USA TV system. He is trying to get me a DVD of it, so it can be used universally and reproduced easily. Today, there are many collectors and builders using Anchor Stone Building Sets. These collectors often participate in setting up Anchor displays at various exhibitions, two of which are being held at this time. A number of them are members of the international Club of Anchor Friends (Club van Ankervrienden), a Dutch club with members from the Netherlands, Belgium, France, Germany, Austria, Switzerland, Great Britain and the USA. The meetings of the Club of Anchor Friends is held in the Hotel Lapershoek in Hilversum. CD-ROM Archive: I can supply the CD-ROMs of the CVA's CD-Archive. More scans are being added all of the time, and the "holes" in the documentation are being filled. Of course, more scans means more CDs, and as scans are added some files are moved to other CD. As of today, there are ten CD-ROMs in the Archive, plus, for CVA members only, 6 additional CD-ROMs of the old MLBs. (Do not try to buy these MLB CD-ROMs unless you are a CVA member. I check the membership list.) All of the scans are JPG files. # 1 contains the GK-NF building and layer plans, excluding # 34, the Anchor book in PDF format in English, plus odd things like box covers, figures, insets, rulers, etc. ; # 2 contains the DS and # 34 building and layer plans; # 3 contains all packing plans, the Anchor book in PDF format in German and the web site with index; # 4 contains the building and layer plans for the second series of GK-Br and Imperator, the VE series; # 5 contains the KK building and layer plans, plus Comet, Erste Folge, Eagle, Imperator (all metal) and mosaic plans; # 6 contains documentation including my book in both English and German and various magazines (like the Anker Zeitung) and magazine articles, plus information on other Anchor products (like Lebkuchen, medicines and mechanical music instruments) ; # 7 contains the building and layer plans for the series 100 (Neue Reihe), 200 (Modern [American] House Series), 300 (Landhaus [Country House] sets), 400 (Festungs- und Burgen-Baukasten [fortress and castle sets]), NS, Capital, Täfelchenlegen, games, VEB, LaVelle, Orion, KMBK (Art Model Building Sets), Eisenbrücken, A-B (American Bridges); # 8 contains the building and layer plans for the series GK-AF, the first series of GK-Br, Exhibition models, Richter (includes his will and other documents regarding his estate), Rudolstadt; # 9 Catalogs, Special Sets, pictures of the original factory (perhaps I will add pictures of the new factory, assuming permission is granted); # 10 Personal Designs, plus advertisements and Im (1st series), and # 11 an overview using PDF and other more modern PC programs and formats. Only the members of the Club of Anchor Friends are permitted to purchase the seven CD-ROMs containing all of the MLBs (up through Fall, 2001), including both the English and the German language translations and an overview CD. CDs of the AHN have been added to the Archive. The AHN needs two CDs, plus a third CD for the overview. If you want to buy one or more of these CD-ROMs, please send $2 (or euros, your choice) for the first CD-ROM and $1 each for the rest -- postage included, no matter where they are going. CDs are inexpensive, so I do not see a problem if, at this stage of the Archive, some CDs may become obsolete due to relocation of files. For the month of June, 2003.